Two recent questions, both related to growing okra, addressed gardeners’ concerns over okra plants that seem to be maturing a bit too slowly. “I live in Santa Fe, NM – 7,000′ elevation, hot, dry and sunny. I’ve tried watering them every day since it’s been so dry lately and they seem to be growing a little faster but no where near 4-5 feet everyone else talks about! Any idea why they are still so small? I never really tracked the progress of my young okra plants but after receiving two similar reports I decided to take a closer look at the okra that is growing in my garden to see if there could be some type of conspiracy or organized work stoppage on the part of the okra collective. Well I have to admit that after checking, my okra plants are no bigger and only slightly taller than those described in that container in New York or the garden in New Mexico. Hmmmm! Before any more paranoia sets in, let’s take a second to be rational about this. First, it’s still pretty early in the season and the okra plants do have plenty of time left to start producing those plump and tasty pods. Also, the ultimate size and height of your okra plants is partly dependent on the variety that you planted, with heights ranging from just a few feet at maturity, to giants that can grow over seven feet tall. To be on the safe side there are a few steps that can be taken to ensure that there will be tall, healthy okra plants and plenty of fresh okra pods to pick in just a few short weeks from now. 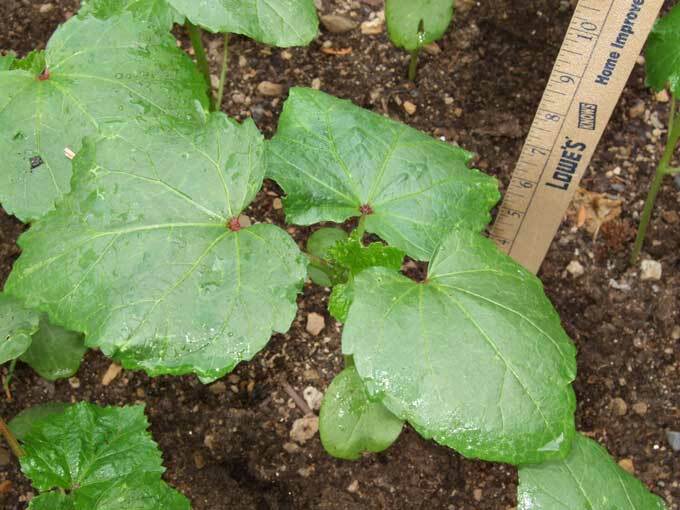 Let’s start by thinning the okra seedlings so that they stand at least eight inches apart. This will give them room to stretch out and soak up more of those energizing sun rays. Continue watering as needed, and it wouldn’t be a bad idea to give the okra plants a shot of liquid kelp, fish emulsion, or other fast acting organic fertilizer. I think that okra plants do typically start out slowly, but once they pick up steam and get a little taller they will begin to branch out, flower, and produce pods pretty quickly. Before you know it we’ll all be talking about a different problem… coming up with new recipes to use all of those delicious okra pods that are harvested from the garden! Still, I’ll be keeping a very close watch over my okra this season just to make sure that the plants aren’t up to no good. Any progress reports and okra updates from your own gardens will be appreciated. The problem that I encounter with okra other than trying to find recipes for all of the pods is keeping up with the harvest. They come on so fast that you end up with many many mature pods in a blink of an eye! Kenny, you don’t seem like the meme type (but then again neither am I and I participated) but I have “tagged” you in the “7 random things about me” meme. You are supposed to write 7 random things about yourself, report back to the blogger who “tagged” you and then select 7 more bloggers. When it came time to pick my seven I selected bloggers who I thought were excellent gardeners and writers and whom I’d like to know more about. You definitely fit those requirements to me. Come to my 7 random things post for more information. I would love it if you would consider playing along. Thanks! My okra is little too. And it’s my second try this year. Of course, the first set I tried to start indoors which in retrospect seems silly. I am a veteran okra grower, but this year I appear to have a problem getting the plants to bloom. My plants are a little over 2 feet tall and I have yet to have a blossum show. I keep them watered well, I don’t fertilize much and there is plenty of heat from the summer day. My plants are gorgeous, but no blooms. Any ideas on what may be the problem? Hi Darren, just give the okra plants more time to blossom. If they are growing and look healthy as you indicate there is nothing that will prevent them from producing blooms and eventually okra pods. Did you plant a different variety this season? Maybe you’re growing a later maturing variety of okra. Thanks for answering Kenny. I have been growing okra for about 20 years now, and this is the first time that I have had an issue like this. I planted around on Mother’s day, so I feel that they have had plenty of time to blossom. My neighbor across the street planted after I did and they are harvesting more than they can use. I have experimented with several different varieties, but have been planting the Clemson Spineless for the past several years and have had wonderful results. Every time I have planted in the past, they have started to bloom around the 8 to 10 inches height. I mentioned earlier that they were about 2 feet tall, but I just went out and measured them and they are just below 3 feet on the average. Normally by now, I am tired of picking and putting up okra, but I have yet to see a blossom on any of the plants. I have 10 rows of okra, each row is 20 feet long, and not a single plant has bloomed. Makes me believe that I have done something wrong, or there is something missing. Darren, that is odd that your okra plants haven’t produced a single blossom, but the plants appear to be healthy and growing so I can’t think of anything that you are oing that would cause that problem. Poor flowering and fruit production can be usually be attributed to inadequate levels of potassium and phosphorus in the soil, but even that would not prevent the development of a single blossom. My only other guess, and this would be a serious longshot, would be that there is an issue with the seed that you planted. You can do a simple N-P-K soil test and if the potassium and phosphorus levels are low, apply a foliar “bloom” fertilizer mixture that is high in these nutrients. Thank you, Kenny. I will do as you say and see what becomes of my okra. I planted okra seeds in the green house, but when I planted them outside in the summer, they either died off or were eaten by slugs. I did manage to get a couple of okra pods off a couple of plants but they did not have much leaves on them. why was this? Hi Malia, the older okra leaves usually die and fall off as the plant matures and continues to grow taller, so the leaves often look pretty sparse towards the lower sections of the stems. As long as the plants are producing a good crop of okra pods I wouldn’t worry too much about the leaves. My okra is growing slowly this year … June 2008. This is my second attempt to grow okra this year, but my first garden. I know it is warm enough and I know it is watered enough, so I am really at a loss. I will try to thin my plants since this is in a container garden. Any insights or helps would be appreciated. My okra has really taken off lately. It seems to grow in spurts. Seemed to take it forever to grow from about 6 inches to a foot, but then shot up to about 2 1/2 to 3 feet. All of the plants are growing pretty rapidly now. It has been producing well for about the last month. Hi Allyson, what kind of shape was the soil in that you used in your containers? Was it reasonably fertile or recycled from previous uses. You may want to feed the okra plants with a good organic fertilizer such as fish emulsion to provide a little boost. But I agree with John that the seedlings start out slowly, my okra plants are a few weeks old and still only a few inches tall. Lisa, the buds should open soon after they form, I’m not sure what the problem is but I would remove the buds that don’t look right and hope for the condition to improve. You could also feed the okra plants a dose of fertilizer that is rich in phosphorous to help promote blooming and fruiting. I’m also having problems with few blooms on my okra. Have harvested three pods. Have regularly fertilized. Only difference from previous years is I’ve put shade cloth above the whole garden area. The shade has improved my tomato harvest and is allowing me to grow some heat tolerant Asian greens here in 110-115 degree Arizona. The okra plants are beautiful. Could the 50% shade cloth be inhibiting formation of blooms? The shade cloth could very well be affecting the growth and production of your okra plants. You may want to experiment with different percentages of shade cloth until you find the best medium for your garden to reduce the heat and allow sufficient sunlight. Okra does not require much Water, Harden them!! let the roots go looking not get soaked and rotten with daily watering…. I have plants in 12 inch pots that are 4ft tall and flowering and producing Okra’s. Let soil get so dry that its cracking… Okra thrives in VERY VERY hot weather and needs very little watering. Shade Cloth??? no such thing needed for Okra.. Full sun as much as it can get is what they love. Shade cloth needs to go! I am sooo glad to have found this site. I am a newbie at growing okra. This is my first attempt and I have an outdoor garden plot with other asst’d veggies…red and green peppers, corn, squash, tomatoes, cayenne pepper, and hopefully cantalope. My main concern and question is what do you suggest as a helper in getting my shoots to grow? I read that they should be thinned out–about 8inches space btwn each shoot. Is this for real? I have heard that okra is “sensitive”. I really enjoy eating okra and don’t want to mess this up. Hi Tosha, if you have decent soil and keep the plants weeded and watered they should grow and produce just fine for you. Okra plants do grow big and tall so you do not want to crowd them. Eight inches apart should be a good spacing. I have planted clemson spineless this year and they got up to about about 3 – 31/2 ft height..I see blossoms but not too many and the blossoms don’t seem to set fruit. What do you think is missing? I have planted these last year and I remember they started producing fruit when they were about 12-18 inches. My friend who has planted 4 weeks after me, her plants are about 2 ft are already producing a ton of okra. The plants look really healthy the leaves are good and green but no fruit. What could be wrong? Hi Sam, do you know if your neighbor is growing the same okra varieties that you are? I wouldn’t worry too much as long as the plants continue to look healthy and are flowering. Okra can self pollinate but cross pollination will benefit the crop and could have something to do with your problem. You could try hand pollinating a few of the flowers just to see if that makes any difference with the fruits setting. WE have 6 rows of okra 10 foot long and as of now they are four foot tall and very healthy with 1 inch diam. stock. We have never had trouble growing okra. We usually buy clemson or cajun type seeds and have had them grow as tall as 12 feet in the past years. This year we did wait a little later so the soil would warm up, planted June 1 this year. As I was saying they are healthy but not a bloom on any. We do have them close together in some areas so they will grow tall. But even the sparse ones are still not blooming. We use a good home made compost, with blood meal and bone meal at early spring. Help.! Okra only really start to do well when it gets really hot. This year, the El Nino weather pattern has resulted in lower temperatures. This may be the conspiracy responsible. Certainly my okra here in Japan have been getting off to a slow start, as have my green peppers which also like the heat. I agree with Rod’s comment about okra plants loving hot weather. This summer my okra is just now a little over three feet tall and beginning to show signs of flower buds. If the plants are healthy and growing strongly they are bound to flower and fruit soon. Just give them more time and keep them weeded, fed, and watered as needed. Chicago – First time okra gardener, and I’ve got 3 plants, North and South variety. They sure seemed to grow so slowly for such a long time, but the weather was much cooler than normal. Once the high temps set in fairly consistently, they’ve been loving it. They’re roughly 3′ tall and I’ve had 4 blossoms this past week, bloomed for a day then fell off, and the pods are getting a little bigger each day. Lots more buds on the way. My grandma, born and raise in Mississippi and an avid gardener, would be so proud! I feel her beaming down from heaven on me and my okra plants. Hi Becky, great job with your okra plants, they can be slow to get growing. I’m sure that your grandma would be very proud of your success and I am too! I planted okra seeds in a 12″ pot, each seed about 2″ apart and I have about a dozen or so seedlings coming up. I live in an apartment (in Texas) and I don’t have a garden to plant them. Can I leave them in the same pot to grow to maturity and expect them to flower? Hi RV, if you have a dozen okra seedlings in one 12″ container then you will need to thin them out a bit. That container could support one or two okra seedlings to maturity but twelve would be much too overcrowded. If the pot is deep enough you should be able to raise your okra seedling to maturity and harvest a crop of okra pods. Are there any okra diseases i should be concerned about in Wisconsin? I’m noticing leaf-curl and die-off on a couple of my plants, just as they’re starting to really throw pods (and outgrow the rodents ;-). Late blight is devastating the nightshades around here, but i don’t know if there’s a connection. Also, can i transplant to extend the harvest? Z5, i can expect a frost in about a month, followed by weeks of maddeningly warm weather. Susan, I’m not aware of any specific okra diseases that you should be concerned about. I think that it’s normal for the okra plants to lose their lower leaves as the plant grows and is nothing to worry about. You can transplant okra but you may not be successful if getting the plants to yield during the mild season after your first frost. It might be better to put the effort into covering and protecting your mature okra plants when the early fall frost strikes your garden. My okra never did make it, back when I last tried it … BUT, I want to try again! Maybe I am just asking for trouble. How long does it take okra to produce from seed to harvest? Having moved to S. Louisiana, I am hoping our long hot summers will allow me to try for small crop. I grow okra in Bristol, New York and find that it seems to like my clay soil. The plants never reach the heights they did when I lived in South Louisiana but they taste great and I have plenty. Starting okra in March after the last frost works well here in Oklahoma. We usually get beautiful tall plants that grow 7 to 8 feet tall by the end of the season. Because I put them in early they are slow to start and when about 12 to 15 inches tall they produce the flowers and pods very well. Our soil here has some clay but I always add some miracle grow potting soil to the area where I plant the okra mostly to help retain a bit of moisture and to add nutrients. Here it is October and I still have okra producing even though its been a bit on the cool side. Be careful Okra plants do not like there feet to wet.I learned the hard way. They will start to yellow. Just talking to other people; okra starts out really slow, but after getting 4″or 5″ they take off. I am having a similar problem with my okra taking forever to grow. Sees like they have been the same size for 3 weeks. I had to kill a bunch of bugs that were growing on them in the last week, but new leaves are coming out and all of that good stuff. I appreciate all the info I have found here. this the very first garden i’ve planted. i planted okra next to dixie lee peas and i may have planted them to close, both the peas and to close to each other the okra. well, my peas has over powered the garden beautiful peas and purple blooms every where, but my okra is about 4 ft tall and very heathy looking plants, but no blooms i planted them around mother’s day. i started giving them plant food, but i have kept them watered a lot in which i’m finding out not to do.they are planted close together is it too late to pull them up. At this stage I would probably just let the peas and okra grow up together and make adjustments the next time around. You could also just cut the pea vines as they reach the tops of the okra plants to help keep them in check. Shelton, just give them time, the okra plants should start producing flowers and pods soon. Well, I can report now here in “Hotlanta”, Georgia that my okra plants are growing like crazy, blooming every day and I am harvesting several pods. Not as many as I would like, but since I only planted 5 that is my fault. I just thought with it only being me who is eating them, I would only need a few. It is true about okra being heat loving plants. Once the temperatures down here started reaching and staying in the 90’s, the okra grew like weeds. They are at least 4 feet tall. I planted them May 1st and thought I had made a big mistake due to their ridiculously slow start. I am keeping a journal so I will know next year how things went. I was told not to give them plant food because it will encourage bigger robust leaves and little to no fruit. So, Matild, I would not be feeding them. thanks Kenny, someone showed me that my okra have little pods or blooms coming on the plants so maybe they will produce after all, we will see. As Tiff stated they will go with hot weather. Our plants are know five foot with leaves that are huge. We have had Japanese beetles trying to eat ours along with the ants. So every day we walk through the plants (3 long rows) and knock them into cans of soapy water and wipe the stems with soapy water to keep the ants from crawling up into the blooms. We grow the big okra pods – they sure are good and easier to fix with less goo. Wonderful steamed, grilled or fried. I have the same problem my okra is two feet tall and no blooms, I keyed on this web to find out I am not alone. THANKS. I live in Arkansas and am experiencing the same problem with my Okra plants. The plants are the prettiest I have ever grown. They are about 6 feet tall but have no blooms. Last year it was my Lima beans. iIhave been gardening for 25 years and have never experienced these types of problems. kenny i took your advice and left the okra along and yesterday i saw a beautiful yellow bloom and now it is turning into an okra. i looked for more, but did not fine any maybe i will have some later. my butter beans are plentiful, but filling out slowly. My okra looks beautiful, but doesn’t have many blooms. I remember the old folks “whipping” the okra to get it to produce. Should I trim some of the leaves? No, do not trim any leaves. Use plant fertilizer and be patient! Hi! I would appreciate any help you can give me. I transplanted two Cajun Delight seedlings into one pot. Oops, they are around 7″ apart or so. They are over a foot tall now and one started to make a flower but it never opened. Do I dare transplant one of these plants into another deep pot? I understand they have long tap roots. Also, why would a flower not open after forming and starting to come out of its sheath? Thank you so much! Chuck, it could be the heat… I doubt that the problem is over watering. Give them more time and hopefully the okra plants will begin producing for you soon. Hi Carissa, some things are just a lot tougher to grow indoors for the long-term unless you have really good grow lights. Any chance to plant them outdoors and use a fence around them? How about planting during the cooler time of year in your region? Other than that I wouldn’t be too concerned about the slower development, it sounds like you are doing things properly so I would just be patient and see how the plants develop. Good luck! I’ve recently learned that root-knot nematodes can cause okra to be stunted. I live in Hawaii, it is always warm enough for okra, I fertilize, I water, I have full sun, but my okra plants start off fine in peat pellets, get to about 8″ tall and just stop. I think it’s the nematodes. Apparently there is nothing much one can do about it short of nuking your soil with some highly toxic, impossible to get fumigant. sorry for the bad news. okra keeps falling off from the caps. Why? Ron, I’m not sure why you okra is falling off, I have never experienced that and the plants generally like hot growing conditions. The lower leaves will fall off of the stalks but the pods should not fall off at all. Has there been any changes since you left your comment? i planted my okra 1st week of march, according to the farmer’s almanac for my area, San Antonio, TX. the almanac also shows that harvesting will begin this 3rd week of April but the plants (clemson spineless) are only 3 inches tall so i gave them some miracle grow and i’m still waiting for them to take off.